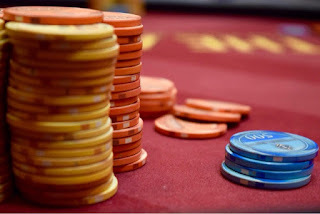 Players are back from dinner break and are playing six more 40-minute levels tonight. Play concludes at the end of Level 17, about 12:15am. Those who make the tradition of the bag-n-tag return Sunday at noon to join the 27 already moving on from Day 1A, and play down to a winner. 62 players cash on Day 2, the winner earning $140,559.